8x10 glass plate negative photographed by Charles Edwin Bolles in 1895. Image of 123' Herreshoff cutter DEFENDER (built 1895 in Bristol, RI) underway. Visible in image: starboard beam view of DEFENDER on running before the wind under gaff-rigged mainsail and topsail, balloon jib and spinnaker, auxiliary steam yacht visible between her sails. Handwritten on negative sleeve: �Defender / Y422 / Bolles / Box 43� and stamped: "Property of "YACHTING" / 38 PARK ROW / NEW YORK". Handwirtten from the negative margin itself top of verso: "Copyright - Defender #12" and adhered to the surface margin area on left edge, "142 " " 20, " ." 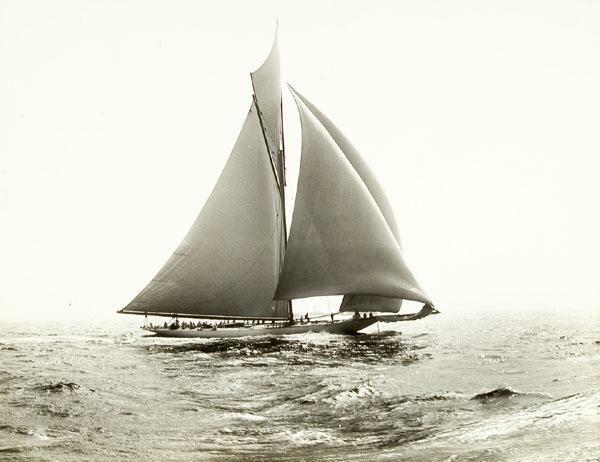 CREDIT LINE: Mystic Seaport, Rosenfeld Collection, Charles Edwin Bolles photographer.